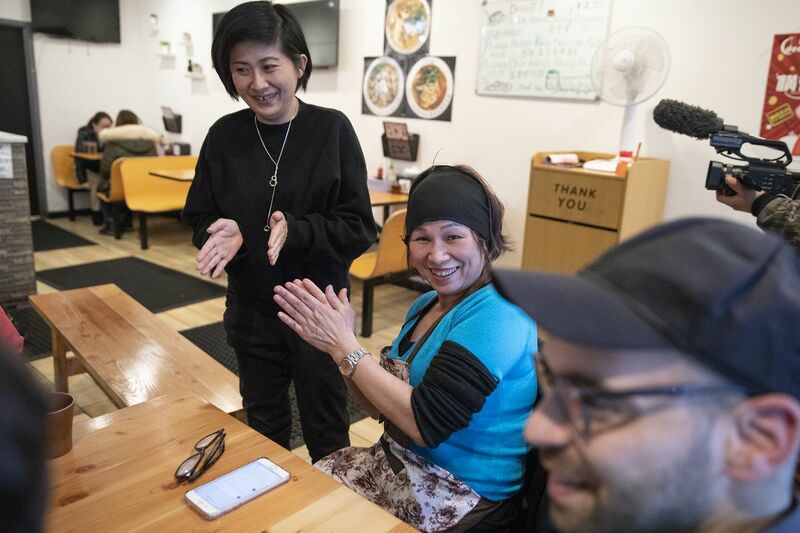 Lily Yau (center) claps along with Hong-Kai Wang (left) and Eric Laska after singing a Cantonese song at her restaurant, Hidden Gem, in Chinatown. And then, the hard part: teaching the song to her students, who didn’t know a lick of Cantonese. This was a “study session,” as conceptualized by artists and professors Hong-Kai Wang and Bill Dietz as part of their nearly monthlong project “Singing is what makes work possible,” in which participants learn songs people sing during work. The pair came to Philadelphia — Wang from Taipei and Dietz from Berlin — on the invitation of a new sound art gallery in Kensington called Remote Viewing, which might be the only space dedicated to sound and media work on the East Coast, its founders Geoff Mullen and Eric Laska say. They knew Wang and Dietz through the “sound scene": Laska, 32, runs an “online journal of contemporary sound” called Lateral Addition; Mullen, 39, studied under Dietz. “Singing” is the second project hosted by Remote Viewing. The first, a monthlong exhibit in February, was orchestrated by Barcelona electronic musician Rubén Patiño, who worked with sounds like laughter to transform Remote Viewing’s space into a dark and strange environment to explore, Laska said. Patiño’s exhibit and “Singing” are exactly the kind of unconventional projects Laska and Mullen wanted to cultivate, and because Philadelphia still has relatively affordable rents, they said, it makes it easier for artists to open their own galleries. That affordability is especially useful for this kind of experimental sound art because it’s not inherently commercial, Laska said. “Singing” is something of a group research project in which participants learn about work songs — and not just conventional paid labor, but spiritual labor, such as Shaker songs, or reproductive labor, the focus of last Saturday’s study session, where participants learned a song sung by Afro Colombian midwives. The idea, Wang said, is to honor songs of everyday life, the kind of art that is often overlooked or forgotten. And the act of singing aloud is crucial to the project, said Wang and Dietz, so participants can think about the relationships between music and labor, not just intellectually, but physically. Lily Yau, front left, owner of Hidden Gem restaurant, sits with her students, Eric Laska, left, and Geoff Mullen, center, who cofounded the Remote Viewing sound art gallery, and Bill Dietz, right, one of the artists behind "Singing is what makes work possible." Each study session features a special guest — Penn music professor Jairo Moreno was Saturday’s speaker — but it’s less of a student-and-teacher interaction: Everyone, including Wang and Dietz, both of whom teach in Bard College’s Master’s of Fine Arts program, learns the music together. It’s a way, Dietz said, to invoke the “creativity of the masses” that Trinidadian historian and activist C.L.R. James described. “We meet each other as messier subjects,” Dietz said. The Hidden Gem study session was something of a fluke: Wang and Dietz discovered the cafe and kept returning to eat, so they broke with form and decided to ask Yau if she’d lead a session. She obliged, choosing the song, putting on her tortoise-shell glasses to read the lyrics from her phone, and painstakingly repeating each line for the participants as they copied down a phonetic score. By the end, Yau was pleased, even if her students could get through only the first verse. “I’m a teacher now,” she said, laughing. Soon after, hungry customers began arriving. The final event of “Singing,” when Wang and Dietz will present the project and play recordings of the study sessions, will be from 6 to 9 p.m., Saturday, April 6, at Remote Viewing, 2131 N. American St. Philly conceptual artist Tiona Nekkia McClodden will also speak.